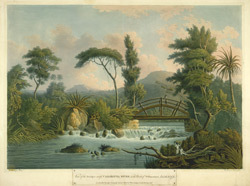 An aquatint of the wooden bridge across the Cabaritta River by Louis Belanger (1736-1816). The unusual semi-circular bridge was located on William Beckford's estate in the parish of Westmoreland in Jamaica. The Cabaritta River is over 25 miles long and flows south west from the parish of Westmoreland to Savannah La Mar.